Задача: The client required the upgrade of two substantial meeting rooms to provide cutting-edge 270 degree ambience projection and thereby completely transform the interior experience. 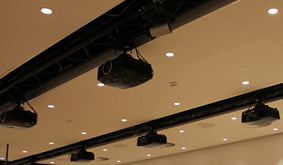 Решение: In total, thirty EX785 XGA projectors were installed in two rooms. 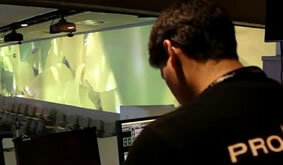 Edge-blending technology produced an image that is over twenty meters wide blended across three sides of the rooms. Результаты: Using over 12 million pixels and the equivalent of 80,000 lumens the resulting images engulf the viewer’s senses and provide an ambience environment only limited by the creative imagination.